One of the nice things about living in Montana’s Flathead valley is the fine talent we have in the area. Monte Mandarino up in Whitefish, Lee Helgeland in Many Lakes, and here in Ferndale, outside of Bigfork is Jerry Fisher. 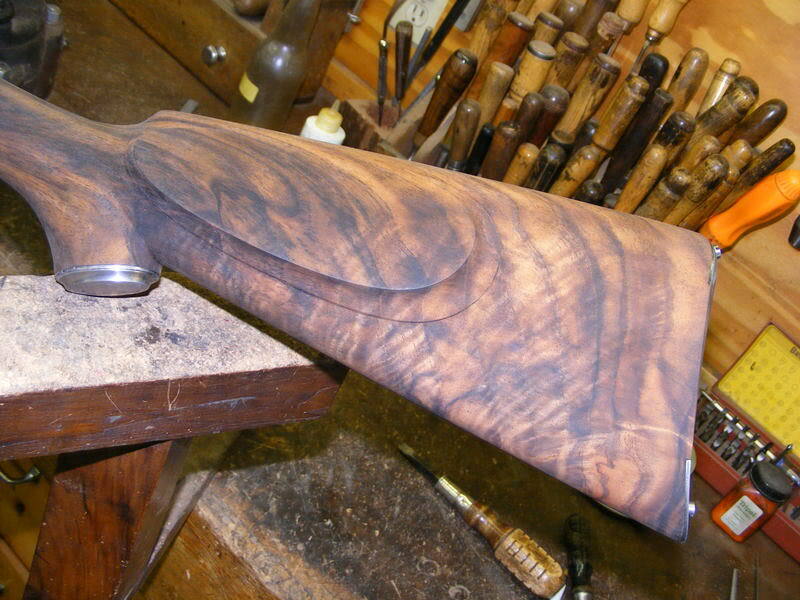 I stopped by his shop this afternoon to say hello and he showed me a really nice piece of work on his bench. 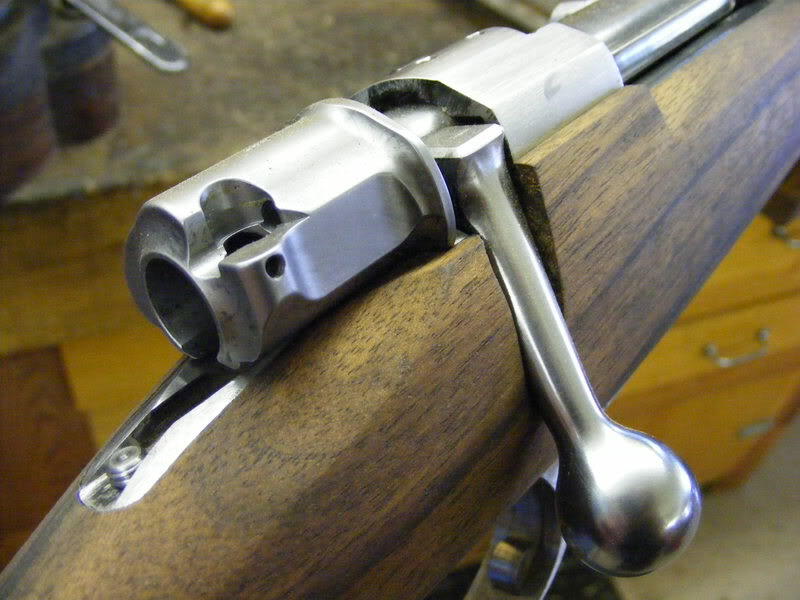 “It’s a Mannlicher stocked Mauser in 7x57, with some improvements”. I asked him about the nicely figured stick of wood. “That’s a piece of thin shell Walnut, grown in Oregon. I have had it about twenty years, an extremely good piece of wood”. I asked him what was to be done next. “Indexing and finishing off the screws”. “I will have about four hundred hours in it by the time I am done, and I don’t know when that will be. I usually have two or three going at the same time, and today for instance, I was working on scrapers”. I was curious if the rifle would have any ornamentation before finishing. “Well, I think its going to Eric Gold, but that’s a ways off yet”. What a nice project this will be, I told him I hope I can see it when it is completed. Thanks for introducing Jerry to the forum. He is considered by many to be the finest stockmaker in the USA and a fine gentleman. I am fortunate to have a custom Ruger #1 stocked by him in 1981. It is the finest gun I own. Montana seems to be full of the finest gun craftsmen. The last I knew, the famous Austrian engraver, Franz Marktl lived in Marion, MT. Also there are engravers Bill Gamradt in Missoula, Jerome Glimm in Conrad just to name a cople off the top of my head. I believe knifemaker/engraver Heinrich (Henry) Frank is also in Montana. Quite a pool of talent. All i know about this man has come from you. I appreciate all you do for us , teaching, tutorials, advice, encouragement. I have you in the top of my list of my highest regard.Thanks to you , this man also. As a woodcarver most of my life I can appreciate fully, the quality of his work. The fit is perfect, all planes are smooth and flowing. Outstanding. Thanks Rick, Jerry is truly an Icon of the american gunmaking world. 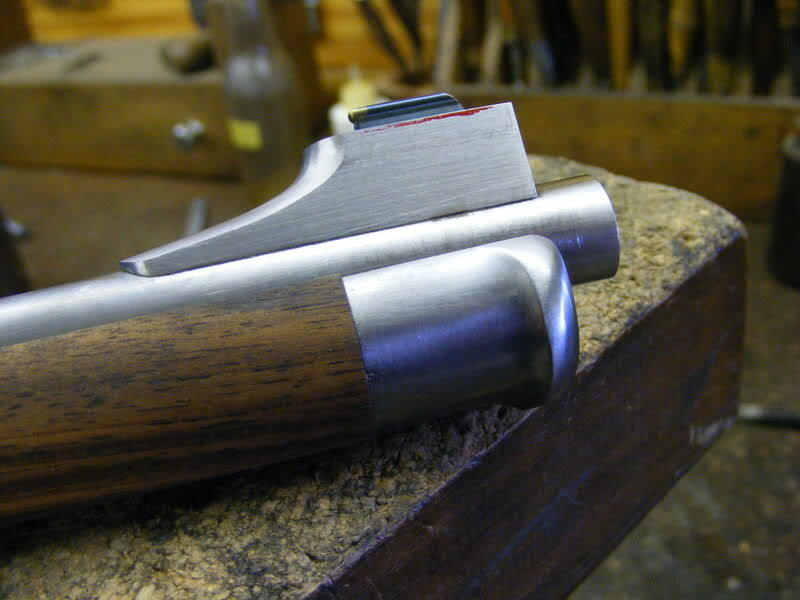 He was the first one I am aware of to actually blueprint the American Classic Style sporting stock for the Mauser, and he still sells those today, Thanks for the comments. There was a gunmaker/gunsmith down here in Miami named Steve Fisher, I wonder if he could have been a relative. There is a lot of distance between Miami and Big Fork, so I doubt there is any relation. 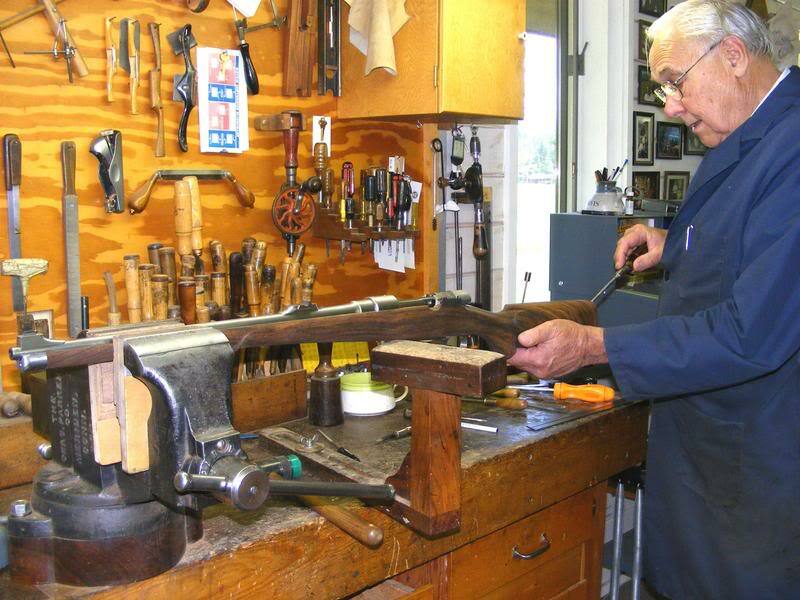 Steve Fisher was one of the best 1911 gunsmiths in Florida, he could make any 1911 sing. He built several competition 1911's for me and each one was a nail driver. His guns were so well tuned that I could put a 5 gal bucket next to my shooting station and 70 - 80% of the shells coming out of the gun would land in the bucket. It sounds incredible, but it is true. Anyway, thanks for the post, this work is beautiful and an inspiration. Jerry is a Grand Master and a gentleman of the first order. I was lucky enough to visit him in his shop a couple of times when he lived and worked in Dubois, Wyoming. I was a college kid with lots of dumb questions and he was very patient and kind to me. Thanks for the looksee Barry, quite interesting. Jerry is truly a National Treasure, as many of you Montanan's are. 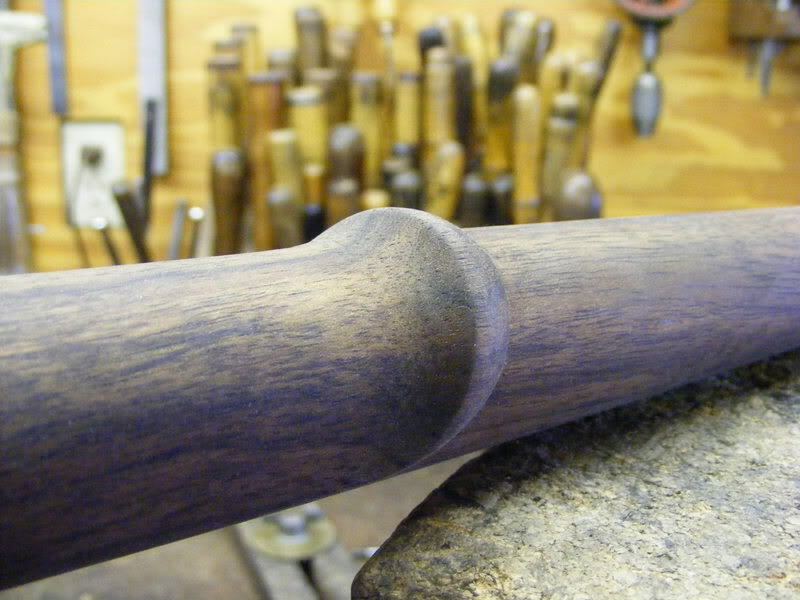 Great information in this thread and a pleasure to see the work and bench of a fine craftsman. Thanks Guys, I dont know Steve Fisher, sounds like a good mechanic. Here is another Fisher pic with engraving by Barry Lee Hands. I'm an old (70) new member, who is interested in information on Jerry Fisher. I noticed your article on Jerry from 2007 and wondered if you could give me an update and information on how to get in touch with him. I have just purchased a rifle represented to be made by him from Cabela's. I am not to terribly trusting toward them and would like to confirm the origin of the rifle and anything else I can find out about it. 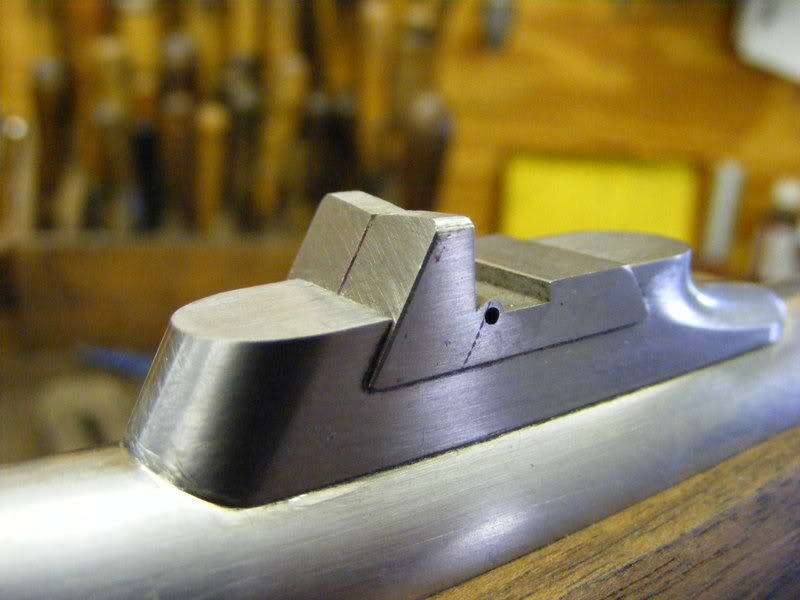 It is a .404 Jeffery on a SSB commercial Magnum Mauser. I like engrave very much. I can't tell for sure from the Cabelas pics. Does it have an address on the bbl? The older ones often do not haver Bbl addresses. 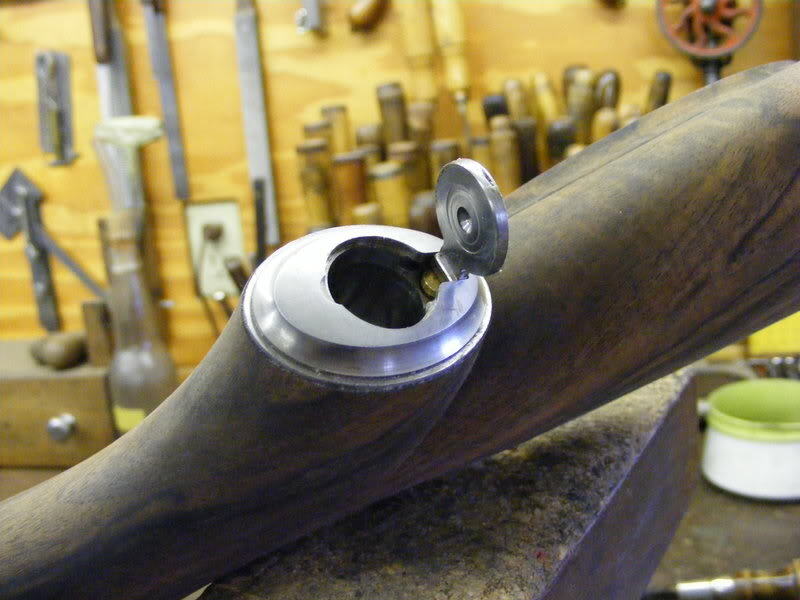 Jerry builds a lot of Mausers. It has a point pattern, which Jerry uses a lot. The finish on the metal appears up to snuff. The island sight is similar to others I have seen from him. I know he had a lot of Griffin and Howe influences, that may explain the mount. The scope may be newer than the rifle, but I am guessing. I don't see anything that says its not a Jerry Fisher, from what I can see. 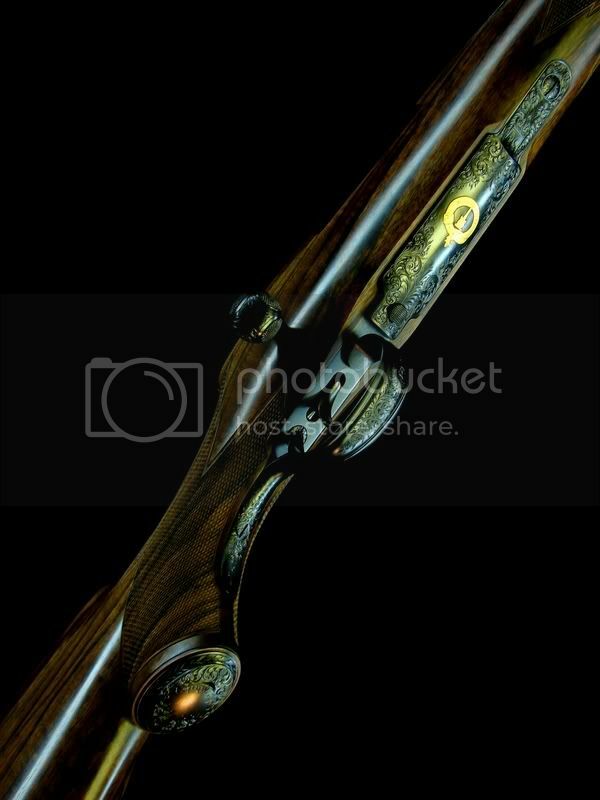 A very nice looking rifle in a respectable cartridge. On page 283 of Monty Kennedy's book "Checkering and Carving of Gunstocks," there is a picture of JerryFisher which must have been taken around 1950 (the copyright date on the book is 1952). He appears to weigh all of about 150 pounds, and looks maybe twenty years old. The book also contains several examples of his gunsrocking efforts, all in Classic Jerry Fisher style. Judging by these, it's easy to see why he has such a wide following today. Beautiful gunwork. Jerry this is Laura Blankenship. I’d like to get ahold of you but don’t have your phone number. Can you give me a call if you get this message or someone that is in contact with him? 406-407-4073. Thanks.